...arguably the best craft table.... ever! Horn HiLo 3005 - shown with optional tailor made hobby mat. Horn HiLo 3005 - shown without optional tailor made hobby mat. Although the basic principle is straight forward, the Horn HiLo 3005 has taken some time to design and develop and now - IT IS HERE!! 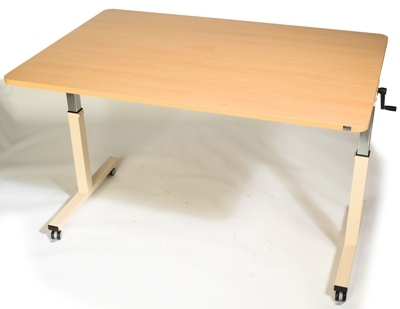 It is a hobby table with adjustable height offering a massive work surface with easy to use "wind up and down" height adjusters. On first inspection, the quality and strength of this piece of furniture becomes immediately apparent. 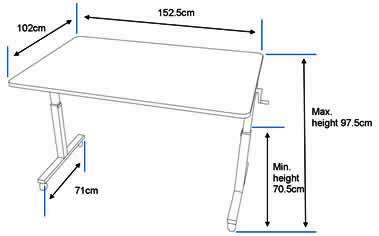 The 1 inch thick table top gives strength and support when required and it has a durable ABS "knock resistant" edging. It is finished with a hard wearing beech veneer and the steel frame is covered in a cream anti bacterial powder coated finish. The industrial grade wheels are lockable and make manoeuvrability and positioning extremely easy, whatever the surface. Using the height adjusting crank handles on each side, the Horn HiLo 3005 can be set from a sitting height of 70.5cm to a full 97.5cm standing height. 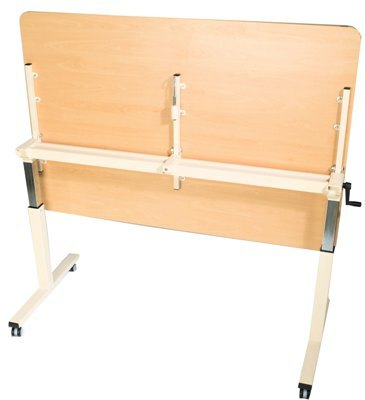 The overall work area is 101.5 x 152.5cm - over 1.5 square meters of work space at a height that suits you!! During the development, many types of height adjusting devices were tried and tested and the crank handles were found to be by far the easiest to use and more importantly, have been well proven for their reliability so you can be assured that your Horn HiLo 3005 table will give many years of pleasure and trouble free service. Exactly what Horn furniture is renowned for. When not in use, the Horn HiLo 3005 can be ingeniously tilted so it takes up a fraction of the space - 152.5 x 71cm.